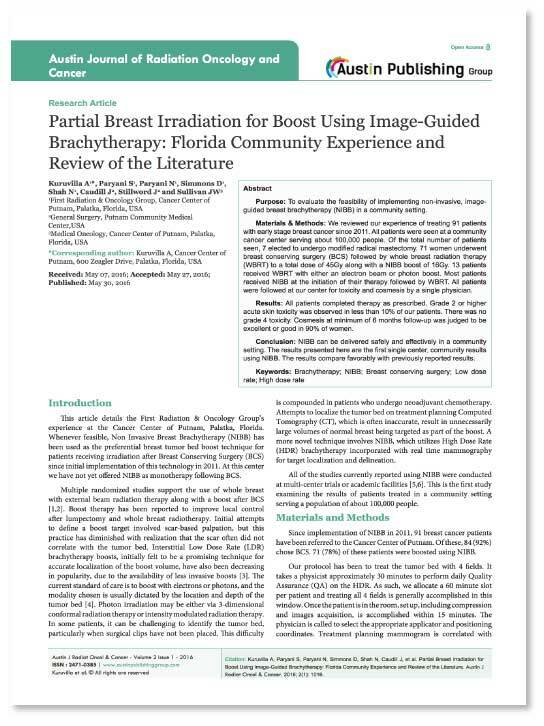 To evaluate the feasibility of implementing non-invasive, image-guided breast brachytherapy (NIBB) in a community setting. We reviewed our experience of treating 91 patients with early-stage breast cancer since 2011. All patients were seen at a community cancer center serving about 100,000 people. Of the total number of patients seen, 7 elected to undergo modified radical mastectomy. 71 women underwent breast conserving surgery (BCS) followed by whole breast radiation therapy (WBRT) to a total dose of 45Gy along with a NIBB boost of 16Gy. 13 patients received WBRT with either an electron beam or photon boost. Most patients received NIBB at the initiation of their therapy followed by WBRT. All patients were followed at our center for toxicity and cosmesis by a single physician. All patients completed therapy as prescribed. Grade 2 or higher acute skin toxicity was observed in less than 10% of our patients. There was no grade 4 toxicity. Cosmesis at a minimum of 6 months follow-up was judged to be excellent or good in 90% of women. NIBB can be delivered safely and effectively in a community setting. The results presented here are the first single center, community results using NIBB. The results compare favorably with previously reported results.